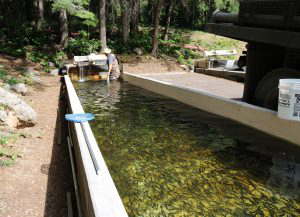 PHOENIX — The Arizona Game and Fish Department (AZGFD) is conducting a $3.3 million renovation of the Sterling Springs Fish Hatchery in Oak Creek Canyon, north of Sedona. AZGFD expects to complete the renovations by June of 2019. The AZGFD-owned hatchery has been in need of refurbishment. The current infrastructure is aging, and some of the piping is more than 70 years old.The pipe, delivery system, valves and concrete raceways are in dire need of replacement. In addition, with decreasing water supplies, it is going to become necessary to be able to operate with less water. The nearly $3.3 million project for Sterling Springs involves the rehabilitation of the water inflow pipes leading to the hatchery, as well as various spring/control boxes along the pipelines. Also, the outside concrete raceways and water pipelines will be replaced. The project includes a cover canopy and fence around raceways, a new storage building, and a partial recirculation system, among other improvements. Such renovations are nothing new. In 1984, AZGFD spent $3.4 million to renovate Page Springs, Tonto and Silver Creek hatcheries in order to keep up with increased trout production. In May of 2014 during the Slide Fire, AZGFD initiated a successful fish rescue operation, moving 600,000 trout from Sterling Springs Hatchery to hatcheries that weren’t in fire danger. See video of the rescue. Rabinovich said he’s grateful that AZGFD commissioners, the governor’s office, and the AZGFD executive staff recognize the importance of the fish hatcheries for the state. Hatcheries play a vital role in maintaining the quality of sport fishing in Arizona. According to the Economic Impact of Fishing in Arizona report, annual recreational sport fishing produces $1.47 billion in economic benefits for the state. Sterling Springs Hatchery is the smallest facility owned and operated by the AZGFD hatchery program, yet has a vital role in the program. Each year, the hatchery produces and supplies hundreds of thousands of trout fingerlings to Page Springs Hatchery (the largest trout hatchery in Arizona) to be raised to a catchable size prior to being stocked. With renovations underway, the hatchery is closed to the public.